Firstly, place the saddle forward of the horses wither. Then slide the saddle back as far as it will comfortable go. This is determined by the confirmation (shape) of the horse, but the resting point of the saddle should correspond with the lowest point of the horse’s back. The points of the saddle tree should now be located in the natural depression that is found directly behind the horse’s scapula (Shoulder). It’s important to get the saddle in the correct position for the horses comfort (to allow maximum weight-bearing efficiency), and your riding position. A common mistake is to place the saddle too far forward over the horses withers. 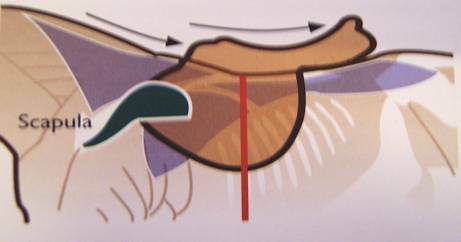 This will have the effect of placing the points of the saddle-tree over the horses scapula causing pressure points which could then impede the horses movement. It may also cause saddle sores. STEP 1 Make sure your horse is standing four square with his head up looking straight ahead. From the near side (left), feel form the top edge of his shoulder-blade (scapula) with your fingers. Lifting the nearside foreleg will help you find the scapula if you are not sure. STEP 3 Taking this mark as your starting point, mould your flexicurve or a piece of stiff wire up and over the withers. STEP 5 Lift the flexicurve and put it down gently in exactly the same place it should settle snugly if it has been moulded correctly. Then transfer the shaped flexicurve onto a piece of paper and draw along the inside. Mark the nearside of the pattern on the paper and send to us. Please use a digital camera and save in GIF or JPEG format (this will make smaller files for e-mail). OR use a normal camera and, once you have had the pictures developed, scan and attach to your e-mail. OR post the information to us using normal photographs.